My search stopped working for a few weeks now. I’ve been pulling my hair to find out why. I’ve even deleted the code and pasted the one in the txp demo site but it still just returns the number of articles. The sample code I am using can be found on github for the pages here and the form. Can anyone spot what I might have done wrong? Might that problem have coincided with the time you merged your two databases? If so, you may need to REPAIR your tables to rebuild the fulltext index. If that doesn’t work, see if you can look up what the index names are in sequel pro or phpmyadmin, then compare that with the table index settings for a new 4.7.2 installation. Make a backup first for good measure! It actually did start then, I think. I will check the index names in phpMyAdmin and report back. After making a backup (am I repeating myself), try first switching to the “operations” tab in phpmyadmin and click on “repair tables”. That might be all yo need. To check the indexes, go back to the “structure” tab you took the screenshot from and at the bottom of that page where the second set of tabs is, you’ll see something like “indexes+” which reveals the indexes. You’ll also see on the “structure” tab that there is an index button/icon next to each table (a grid with a flash across it). I tried it but the repair table is under the “Structure tab.” No search results. The indexes custom_2 and custom_2_3 seem to be equal and one of them could possibly be removed. The indexes custom_2 and custom_2_2 seem to be equal and one of them could possibly be removed. Interestingly (screenshot again) I see no custom_2_3 and custom_2_2. I can see the “index” link on every row. Apologies for this but it seems to be out of my depth… even with step by step instructions I do not seem to be seeing what you describe. Those two may be duplicate indexes from the merge. Click on the “drop” buttons next to custom_2_2 and custom_2_3 in the indexes list so that all that remains is custom_2. Does your search now work correctly? BTW: You have a number of extra fulltext indexes in there that aren’t part of the normal installation. I wonder if you perhaps added them at some point with wet_haystack. even with step by step instructions I do not seem to be seeing what you describe. 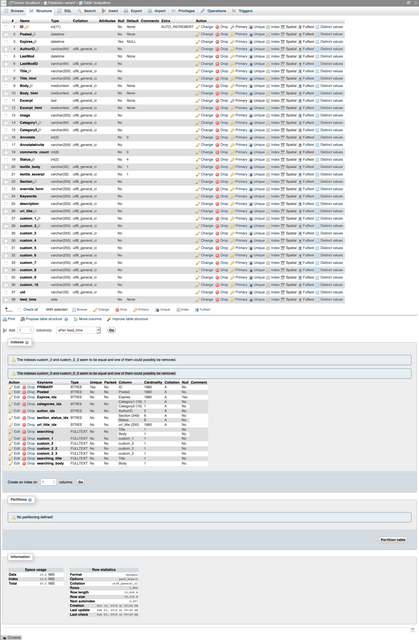 That might be just down to different versions of phpmyadmin. 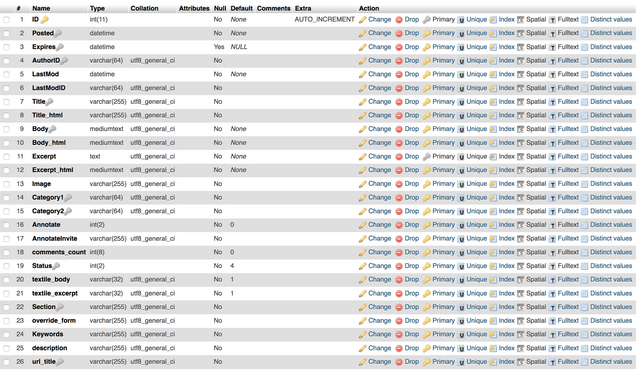 It might indeed be different phpMyAdmin versions as for the life of me I can not find any “indexes+” anywhere. I did drop the two extra customs but alas no results yet. I guess that the indexded rows of the textpattern table are the ones below. Indeed I did use wet_haystack some time ago. Yiannis, check searchable_article_fields in your txp_prefs table. It should be Title, Body, but I’m sure it’s not the case for you. You can also reinstall wet_haystack and set it to Title, Body to remove eventual leftover indexes. And that did it!!! My remaining hair is saved!!! All I need to do now is limit te number of results/page! Thanks so much guys.